Brisbane, sunny Queensland: UXAustralia 2012 set off with a theme that was to run through the entire 2-days of intense UX thinking. That theme was humanity and the trail was blazed by keynote speaker Bill DeRouchey. Bill went beyond the need for empathy and called for designers to have compassion towards their users, to really understand their needs. In his presentation, ‘The power of “Why?“‘, Bill mentioned compassion (think Dalai Lama) and curiosity (think Curiosity Mars rover) as the key ingredients to great designs and great humans. Windows Metro was a heated topic during the conference with both proponents and opponents of the new design guidelines being brought out by Microsoft. Shane Morris presented ‘How I became authentically digital‘ which took us on a journey through this new design language / interaction style / attitude (whichever way you look at it). Remember the Bauhaus principle – form follows function? Bronwyn van der Merwe from Massive Interactive showed us how she helped the BBC create a global experience language to ensure consistency in their brand, vision, user experience, visual design, navigation and interaction in the different products and services offered by the media company across multiple platforms. The magnitude of the project was prominent and so were the outcomes. Check out www.bbc.co.uk/gel for the amazing work they’ve done and to download reusable assets and design patterns which you can use for your own projects. 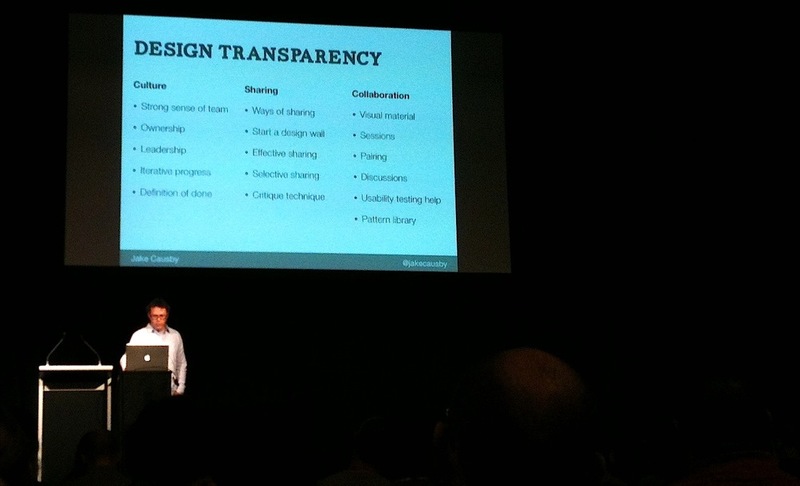 Jake Causby talked about design transparency and framed his talk around the 3 pillars of design transparency – culture, sharing and collaboration. Some of key highlights of his talk were the benefits of having a design wall in the office and the definition of done (what done means to you and how getting early feedback from the client is important). His full presentation can be found at www.jakecausby.com/uxa. Maria Salas from Westpac took us through the design processes they used to come up with innovative solutions for the Westpac iPad app. One such process involved using physical objects (e.g. furry balls) to conceptualise designs. Maria pointed out that using these physical objects instead of mockups and prototypes resulted in the designers focusing more on the concept of (say, making a payment) rather than the nitty-gritty details of design or biases resulting from design elements such as wireframes. She also highlighted the importance of unlearning existing prejudices and old habits to form new insights. Continuing the theme of humanity and ethics (using toilet paper on stage! 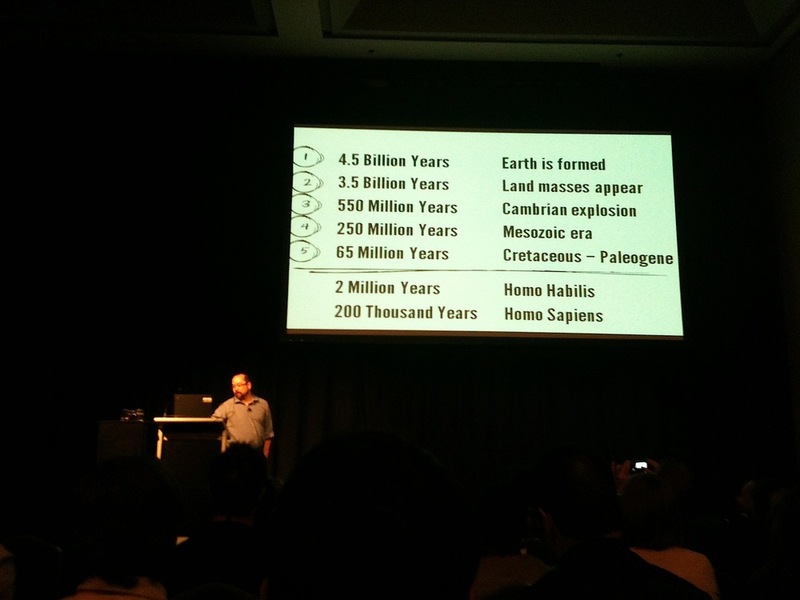 ), Stephen Cox demonstrated how we humans are just the seedlings in the 4.5 billion years of earth’s history asking questions bigger than the ones we usually ask during a typical session of contextual inquiry. What does it mean to be human? The presentation touched on sociology (norm, scripts and breaching experiments) and showed how adding stories to objects can significantly increase the value of the object. Stephen stressed that design and anthropology can change humans and urged the audience to make that change a positive one so that our future generations don’t turn into the kind of humans depicted in the sci-fi movie, Wall-E.
Would you design technology that turns humans into these? Joji Mori from the University of Melbourne went morbid (not really) and talked about death, especially the death of users and the design considerations for the possibility of the user’s death or a user that has died. Check out www.deathswitch.com and www.legacylocker.com. Steve Baty recommended researching not just customers but ex-customers (why they left) and even people who don’t want to be customers. In his presentation ‘Sources of Innovation‘, he inspired the audience to ‘Be extreme! Be Bold! Think BIG!’. Involve the client in the journey. Be clear what you’re delivering. Do things that produces artefacts. While the rest of us have been designing websites and apps, Tim Horton has been busy designing cities! Tim wrapped up the conference in grand style with his presentation on the grand designs happening in Adelaide city. Check out www.5000plus.net.au or follow #5000plus. Overall, I thoroughly enjoyed the conference and the great people and minds I had the privilege of mingling with.Thank you Steve Baty and Donna Spencer for another job well done! And thanks to Objective Digital for sponsoring our trip. Did you attend the conference? What were your highlights? Feel free to share below. Nirish is a User Experience Consultant at Objective Digital. When he’s not designing experiences for his users, you’ll find him tinkering with his DSLR in front of a sunset, testing his fiancé’s patience. 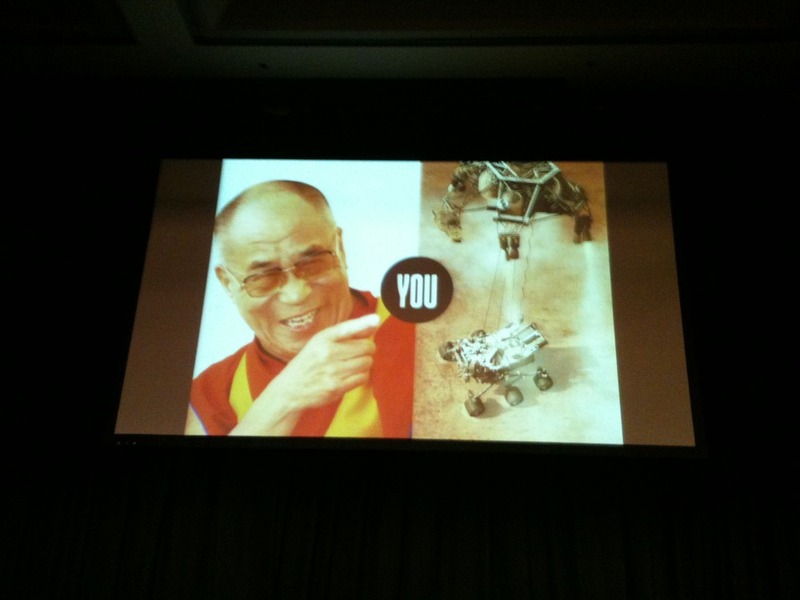 This entry was posted in Uncategorized and tagged conference, reflections, UXAustralia by Nirish Shakya. Bookmark the permalink.